Yet another amazzing Dockercon ! 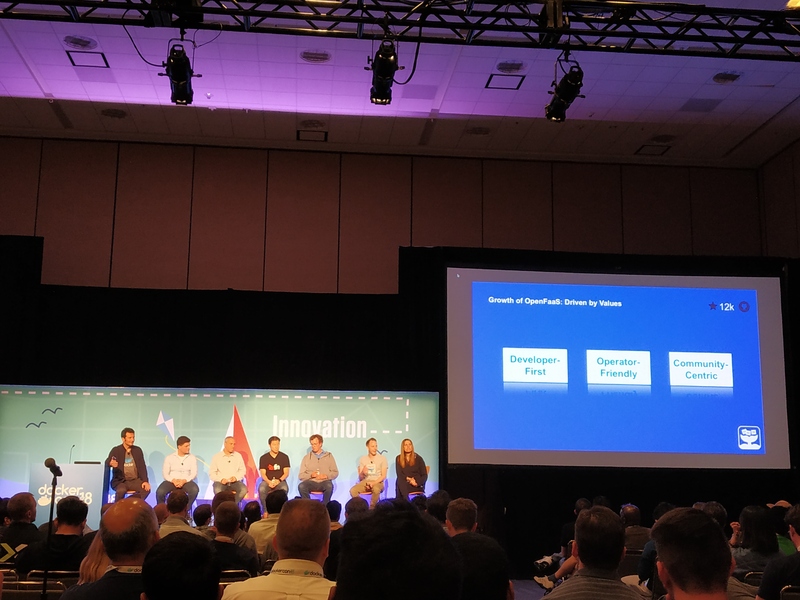 I attended Dockercon 2018 last week which happened in the most geographically blessed city of Northern California – San Francisco & in the largest convention and exhibition complex- Moscone Center. 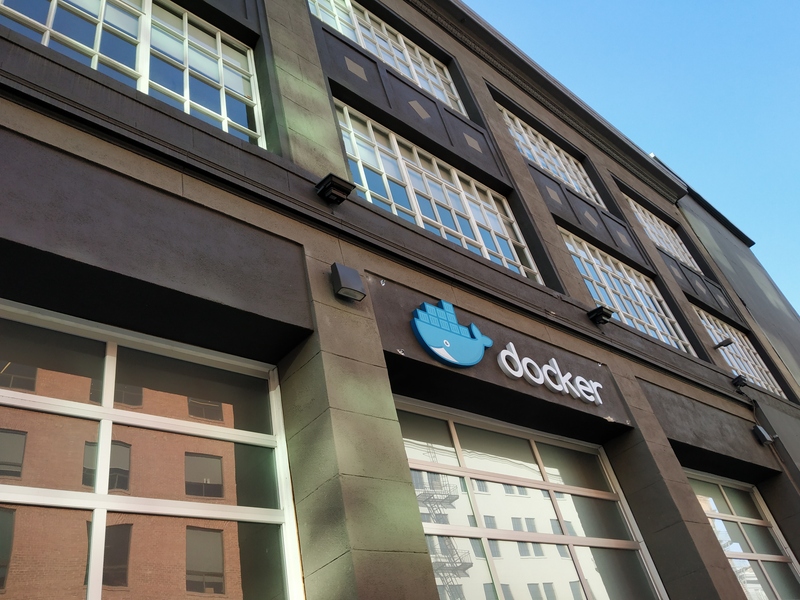 With over 5000+ attendees from around the globe, 100+ sponsors, Hallway tracks, workshops & Hands-on labs, Dockercon allowed developers, sysadmins, Product Managers & industry evangelists come closer to share their wealth of experience around the container technology.This time I was lucky enough to get chance to visit Docker HQ, Townsend Street for the first time. It was an emotional as well as proud feeling to be part of such vibrant community home. Under this blog post, I will go through each one of the announcements in details. This time Docker introduced new application management capabilities for Docker Enterprise Edition that will allow organisations to federate applications across Docker Enterprise Edition environments deployed on-premises and in the cloud as well as across cloud-hosted Kubernetes. This includes Azure Kubernetes Service (AKS), AWS Elastic Container Service for Kubernetes (EKS), and Google Kubernetes Engine (GKE). The federated application management feature will automate the management and security of container applications on premises and across Kubernetes-based cloud services.It will provide a single management platform to enterprises so that they can centrally control and secure the software supply chain for all the containerized applications. With this announcement, undoubtedly Docker Enterprise Edition is the only enterprise-ready container platform that can deliver federated application management with a secure supply chain. Not only does Docker give you your choice of Linux distribution or Windows Server, the choice of running in a virtual machine or on bare metal, running traditional or microservices applications with either Swarm or Kubernetes orchestration, it also gives you the flexibility to choose the right cloud for your needs. If you want to read more about it, please refer this official blog. The partnership between Docker and Microsoft is not new. They have been working together since 2014 to bring containers to Windows and .NET applications. 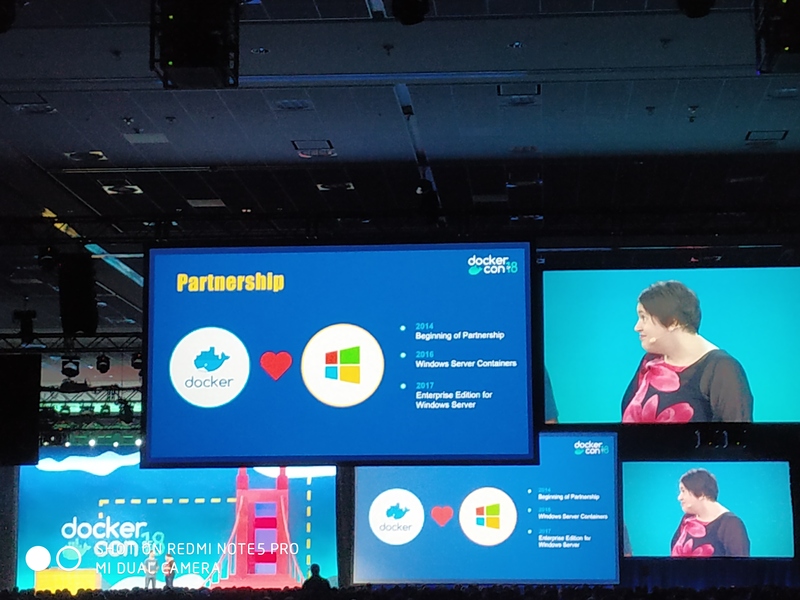 This DockerCon, Docker & Microsoft both shared the next step in this partnership with the preview and demonstration of Kubernetes support on Windows Server with Docker Enterprise Edition. 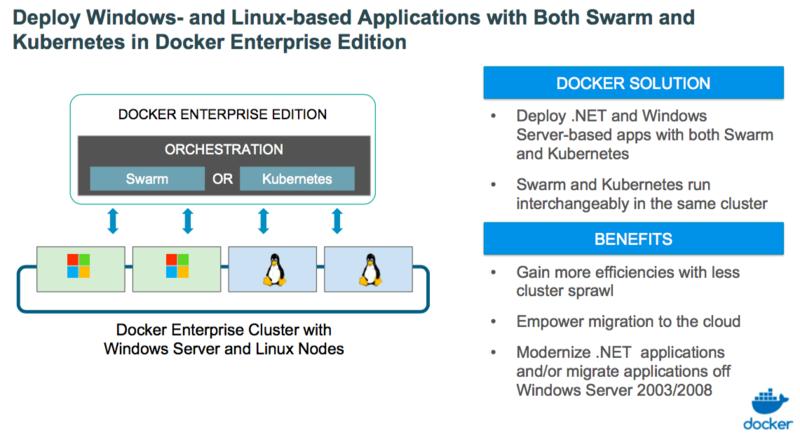 With this announcement, Docker is the only platform to support production-grade Linux and Windows containers, as well as dual orchestration options with Swarm and Kubernetes. 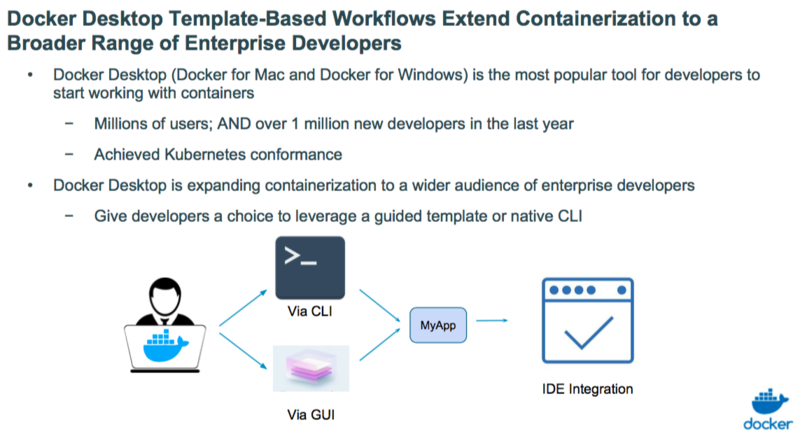 There has been a rapid rise of Windows containers as organizations recognize the benefits of containerisation and want to apply them across their entire application portfolio and not just their Linux-based applications. Docker and Microsoft brought container technology into Windows Server 2016, ensuring consistency for the same Docker Compose file and CLI commands across both Linux and Windows. Windows Server ships with a Docker Enterprise Edition engine, meaning all Windows containers today are based on Docker. Recognizing that most enterprise organizations have both Windows and Linux applications in their environment, we followed that up in 2017 with the ability to manage mixed Windows and Linux clusters in the same Docker Enterprise Edition environment, enabling support for hybrid applications and driving higher efficiencies and lower overhead for organizations. Using Swarm orchestration, operations teams could support different application teams with secure isolation between them, while also allowing Windows and Linux containers to communicate over a common overlay network. If you want to know further details, refer this official blog. 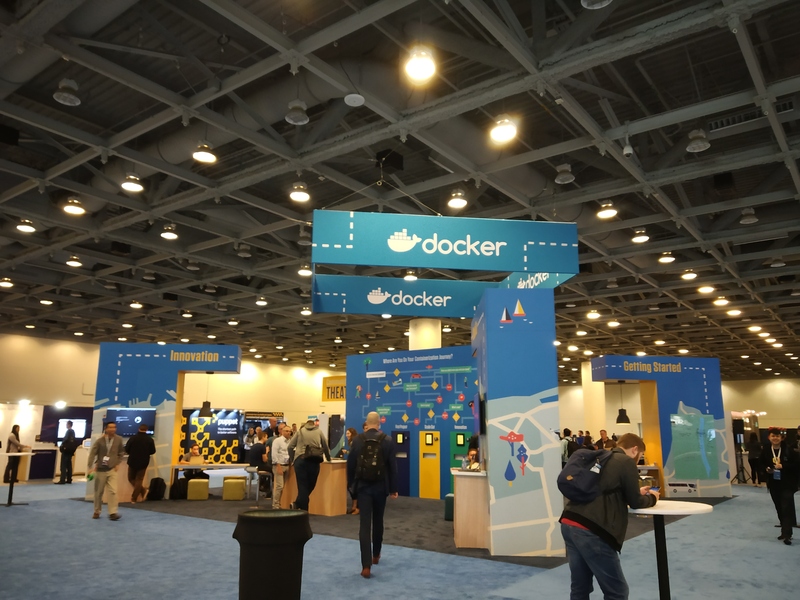 Dockercon 2018 was NOT just for Enterprise customers, but also for Developers. 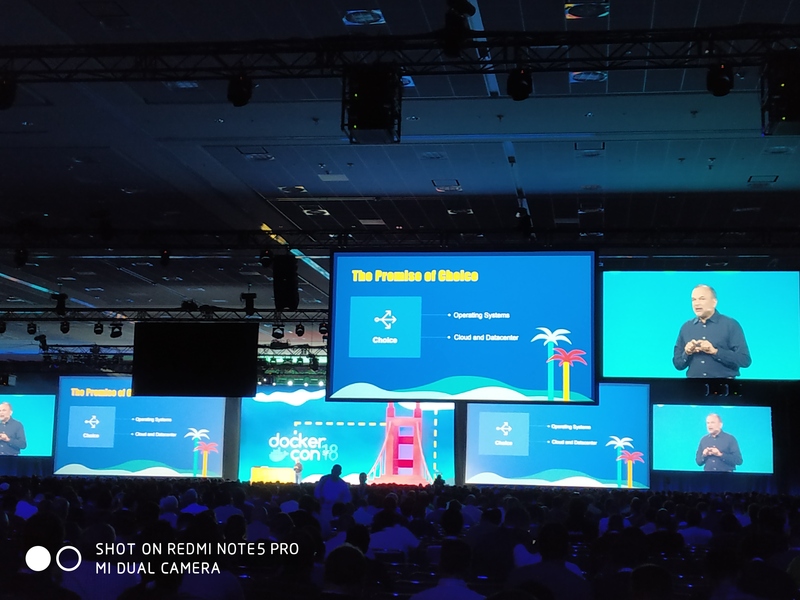 Talking about the new capabilities for Docker Desktop, it is getting new template-based workflows which will enable developers to build new containerized applications without having to learn Docker commands or write Docker files. This template-based workflows will also help development teams to share their own practices within the organisation. 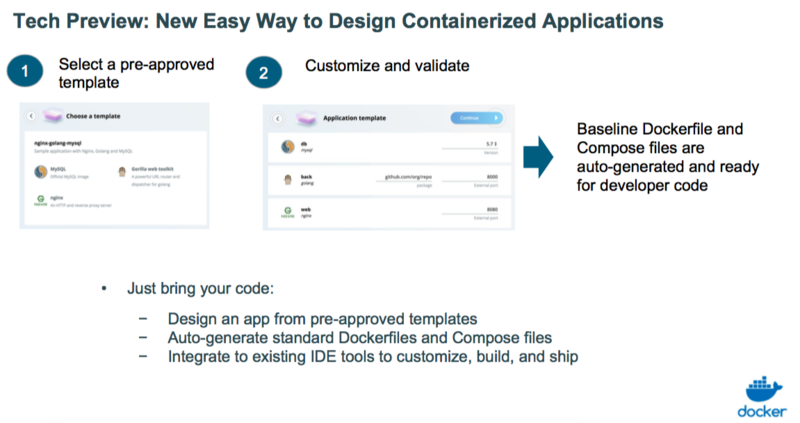 On the 1st day of Dockercon, Docker team previewed an upcoming Docker Desktop feature that will make it easier than ever to design your own container-based applications. For a certain set of developers, the current iteration of Docker Desktop has everything one might need to containerize an applications, but it does require an understanding of the Dockerfile and Compose file specifications in order to get started and the Docker CLI to build and run your applications. You will see new option – “Design New application” as shown below Preference Pane UI. It will be 100% graphical tool/feature. This tool is a gift for anyone who doesn’t want to write Dockerfiles or Docker compose file. Once a user click the button to start the “Custom application” workflow , he will be presented with a list services which he can add to the application. Each service which is selected will eventually become a container in the final application, but Docker Desktop will take care of creating the Dockerfiles and Compose files as complete later steps. Under this beta release, currently one can do some basic customization to the service like changing versions, port numbers, and a few other options depending on the service selected. When all the services are selected, one should be ready to proceed, supply the application a name and specify where to store the files that will be generated and then hit the “Assemble” button. The assemble step creates the Dockerfiles for each service, the Compose file used to start the entire application, and for most services some basic code stubs, giving one enough to start the application. If you’re interested in getting early access to the new app design feature in Docker Desktop then please sign up at beta.docker.com. 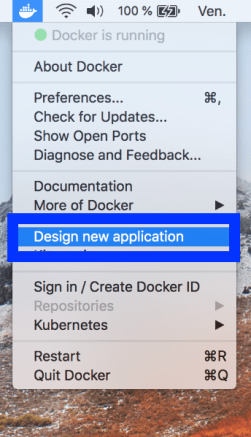 Soon after Dockercon, one of the most promising tool announced for Developers was Docker Application Packages (docker-app). The “docker-app” is an experimental utility to help make Compose files more reusable and sharable. What problem does application packages solve? Fundamentally, Compose files are not easy to share between concerns. Docker Application Packages aim to solve these problems and make Compose more useful for development and production. Recently, Function as a Service (FaaS) programming paradigm has gained a lot of traction in the cloud community. At first, only large cloud providers such as AWS Lambda, Google Cloud Functions or Azure Functions provided such services with a pay-per-invocation model, but since then interest has increased for developers and entreprises to build their own solutions on an open source model. 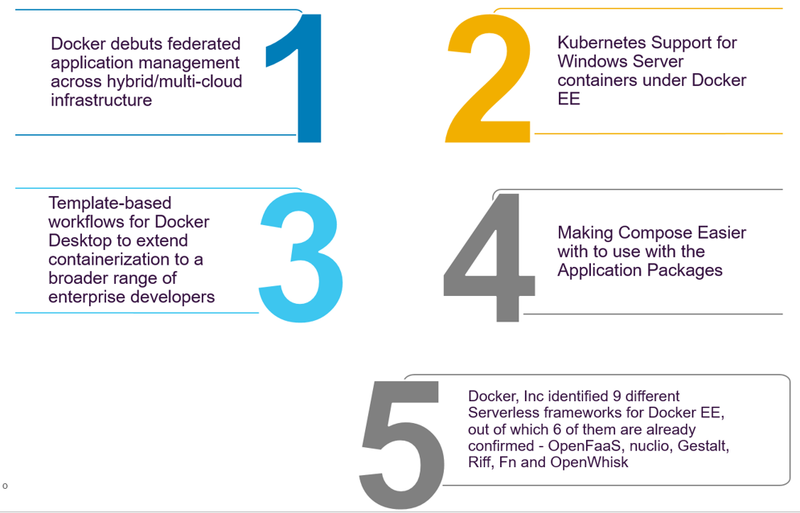 This Dockercon, Docker identified at least 9 different frameworks out of which the following six: OpenFaaS, nuclio, Gestalt, Riff, Fn and OpenWhisk were already confirmed to be supported under the upcoming Docker Enterprise Edition. Docker, Inc started an open source repository to document how to install all these frameworks on Kubernetes on Docker EE, with the goal of providing a benchmark of these frameworks: docker serverless benchmark Github Repository. Pull Requests are welcome to document how to install other serverless frameworks on Docker EE. Did you find this blog helpful? I am really excited about the upcoming Docker days and feel that these upcoming features will really excite the community. 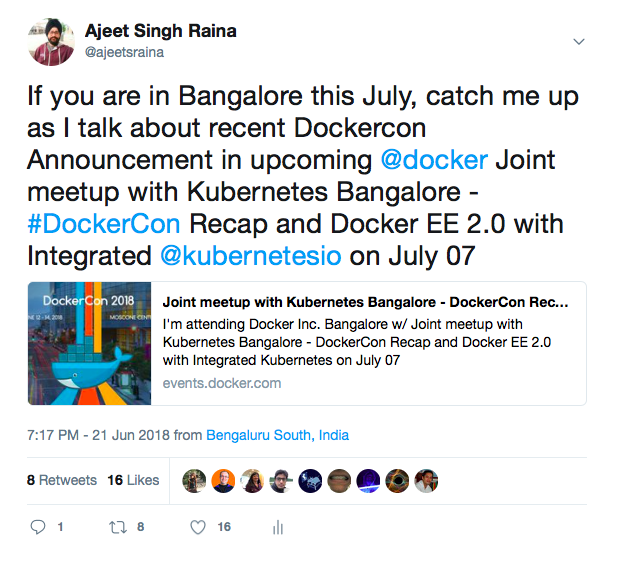 If you have any questions, join me this July 7th at Docker Bangalore Meetup Group, Nutanix Office where I can going to go deeper into Dockercon 2018 Announcements. See you there..